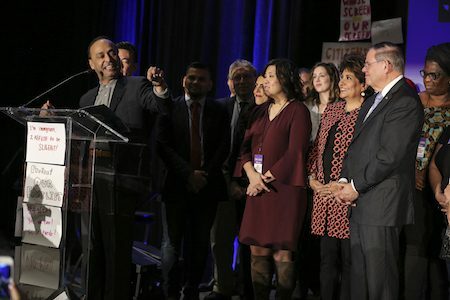 Launched by NPNA in 2008, the National Immigrant Integration Conference: New American Dreams (NIIC) is the largest conference on immigration and refugee issues in the U.S. It is the hub for and plays a central role in the powerful, diverse and broad immigrant and refugee rights and integration fields. NIIC encapsulates NPNA’s commitment to an inclusive democracy that welcomes, integrates and uplifts all refugees and immigrants, recognizing the vital contributions and impact they have on our nation. NIIC annually convenes over 1,000 policymakers, academics, corporate and community leaders, researchers and practitioners, faith and labor leaders, and funders and activists from across the country, as well as increasing cohort of international partners from Canada, Mexico and Europe. The conference provides a generative, collegial space for participants to learn from and inspire one another; uplift and share ideas, information, strategies and innovations; develop and enhance relationships; amplify shared values; and build campaigns and collaborations. It is an important space for both leaders and organizations, draws prominent national thought and policy leaders, and strengthens collaborative efforts and partnerships that power work at the local, regional and national level all year round. NIIC is anchored by several leadership teams, including national Executive and Steering Committees, and several Program Planning teams; typically, more than 70 organizations are involved across these entities. To help reach diverse audiences and make NIIC accessible to leaders all across the country, each year, NPNA co-hosts the conference with NPNA member organizations and core allies in different regions. Since its inception, NIIC has been hosted in CA, CO, FL, IL, MD, NY, TN, VA and WA and more than 8,500 have attended. NIIC runs for three days, includes several MainStage Plenary sessions, over 35 Breakout sessions organized in 10-15 Issue Area Tracks, numerous peer-led Affinity Group Caucuses, Performances, Film Screenings, Author Talks, an Expo and more. The conference annually features more than 175 Speakers -- including notable policy makers and influencers, advocates and culture shapers. To see full NIIC website which includes photos, videos and registration information click here.